A young boy juggles to survive in his medieval village. He comes upon a celebration of the Christ Child and the Blessed Virgin and decides to perform his juggling as a gift in front of their stained glass images. The Christ child appears sad in the artwork, so the juggler is determined to make him happy. He performs at his finest, and when he is finished, he faints from his efforts. Soon after, the crowd notices that images of Mary and the Christ child are now smiling. juggler” as its mascot. But, more importantly, the lesson learned from the juggler is one that has helped faculty, staff, students and parents through a major consolidation, as all have put forth an effort aimed at doing their best work for Christ. 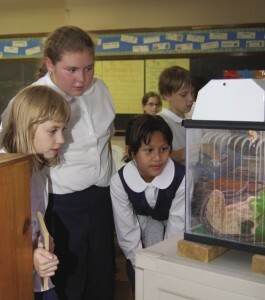 With the 2009 school year, a new era began with the opening of Notre Dame Elementary School. 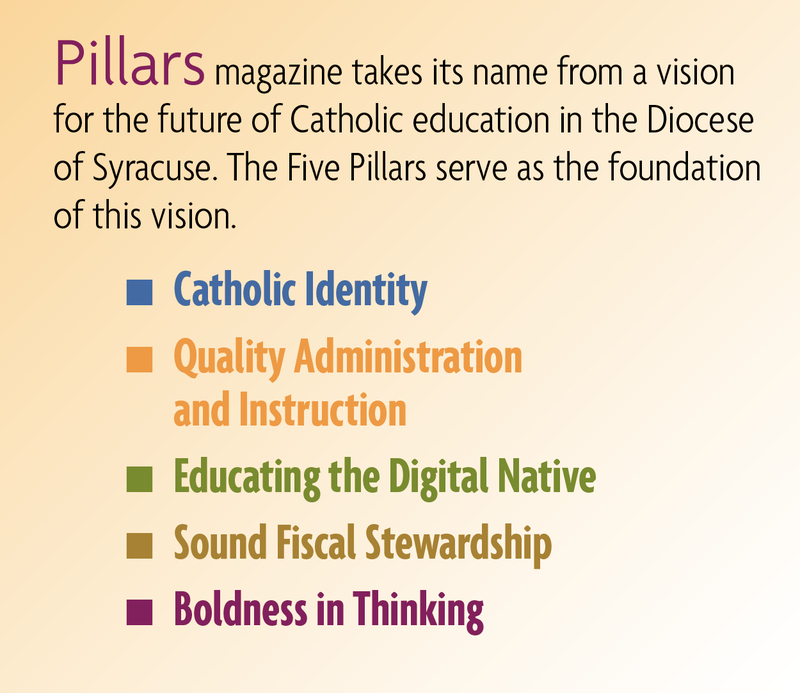 With it began the vision of a truly unified Catholic school system in the Utica area, as three schools came together: St. Peter’s School in No. Utica, St. Mary’s School in Clinton, and Our Lady of Lourdes School, on whose campus the new school now resides. Bringing the children together would prove to be the easy part, as children are much more adaptable to change than adults. With that in mind, the administration conducted a workshop over the summer for all interested staff to become trained in Positive Behavior Interventions and Supports (PBIS). Although the philosophy behind PBIS is to focus on children’s behavior, the staff needed to have a common language that would unify the school. Working with Peaceful Schools, members of the staff learned how to identify rules that could be adapted to the building and teach these rules to the children in a humorous yet effective way. The result has shown that the children responded positively. While the teachers and the children have been working hard to establish a rapport, the administration has been working diligently with a committed group of volunteer parents. They have come together to form the school’s new advisory board known as the “Commission.” This group has drafted a mission statement for the new school and has begun a strategic plan with definitive long- and short-term goals. With only a few months of school behind Notre Dame Elementary, the group has already completed work on Catholic identity, staffing, curriculum, enrollment and facilities and intends to help steer the direction of the school for years to come. At the school’s opening faculty meetings last fall, the teachers echoed many of the thoughts of the newly formed commission. They felt strongly that one area should be the focus: Catholic identity. Although each of the merged schools had a unique faith community of its own, the faith was one pillar that all could hold onto for support during this transition. The faculty believed that prayer and the traditions of the Church would ground the children and their families, allowing for a smoother transition. They believed that relationships here on earth would be fostered through a stronger relationship with the Lord. The relationships created have been the outcome of what many would say was a merger necessitated by a desire for sound fiscal management of available resources. Undoubtedly that is true. But the relationships that have formed due to the founding of this new school will be lasting. The students have built friendships that will follow them onto the basketball court where Catholic school students are no longer their adversaries but are their friends. Parents have reached out to each other to make each other feel welcome. Teachers who had been teaching at the existing site have been partnered with new teachers to help them become acclimated to a new school. While the first year of the transition is not yet over and there is still work to be done, one thing is clear. Just like the juggler, everyone gave their all — students, teachers, staff and parents. And, the community at Notre Dame Elementary certainly believes that the Christ child is, indeed, smiling down on their efforts.